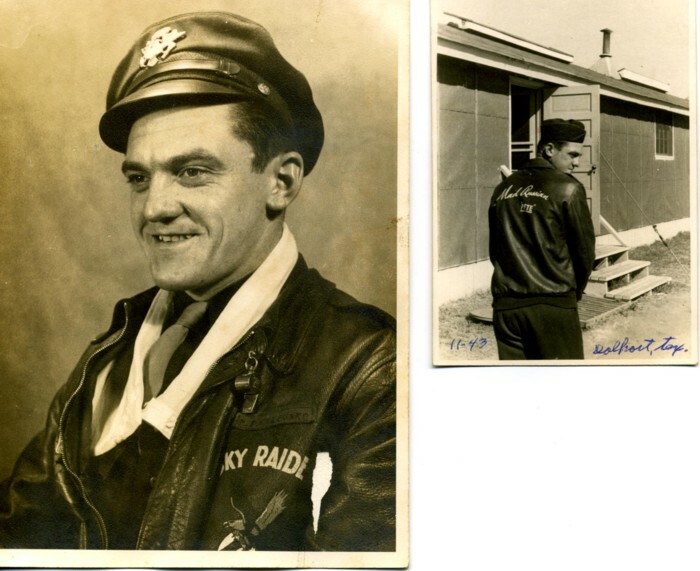 I'll bet these guys were probably there at Normandy: These tunics belong to friend Willi Schumacher (Bob Wirtz Photographs - I have Willi's permission to post these). 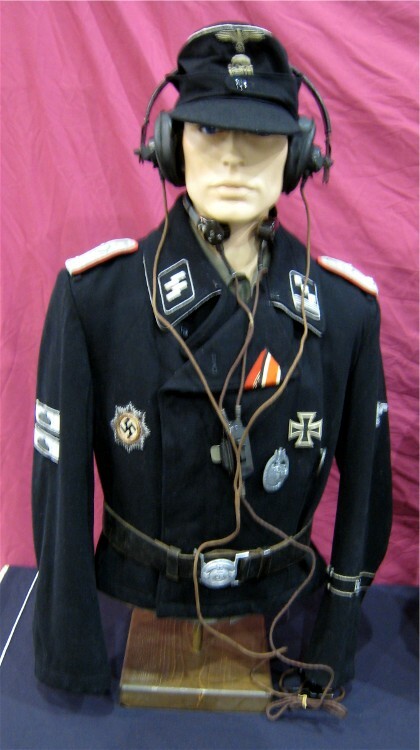 SS-Hauptsturmfuhrer black panzer jacket and field cap from SS-Panzer-Regiment 2, 2. SS-Panzer-Division "Das Reich"
SS-Hauptsturmfuhrer of Aufklarungs Assault Gun (StuG) Jacket from SS-Panzer-Aufklarungs-Abteilung 2, 2. 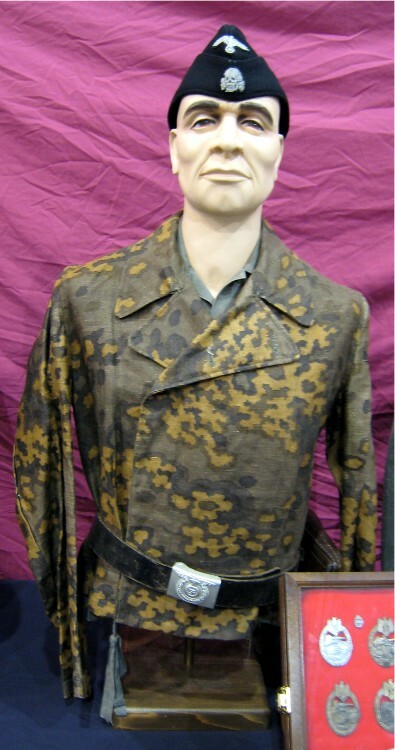 SS-Panzer-Division "Das Reich"
SS-Oberscharfuhrer of Panzerjager Assault Gun (StuG) Jacket from SS-Panzerjager-Abteilung 2, SS-Panzer-Division "Das Reich"
And since the Waffen-SS was wearing a lot of camouflage during the Normandy Campaign, this might have been there too. Well, actually one like it. 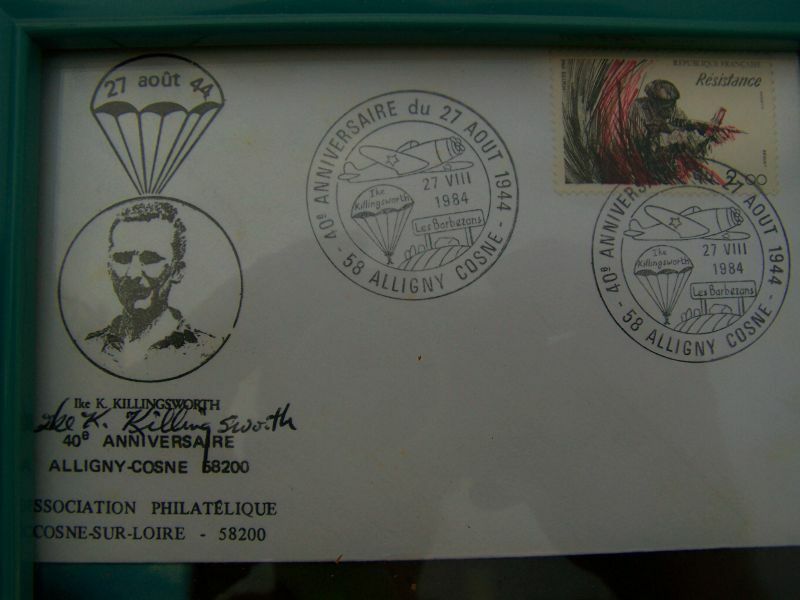 This one was in a depot and that is where it was captured; never issued... still has sizing in the material. You cannot get too much more MINT than this piece. Also has matching trousers and factory paperwork with all matching size stencils. My uncle Capt. 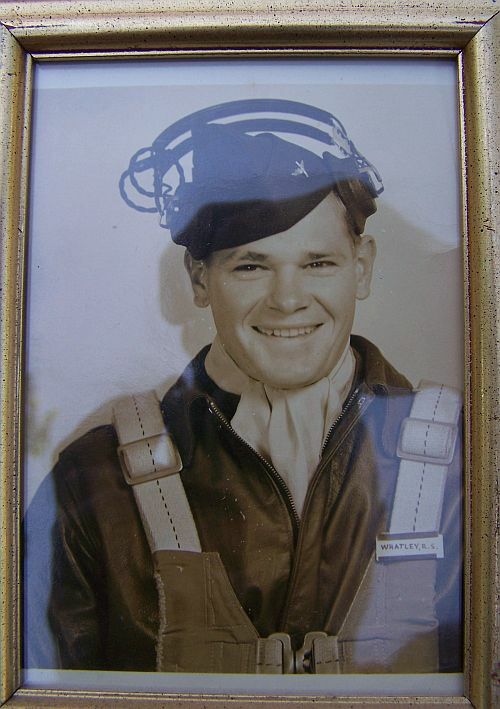 Peter P. Chepurko flew 2 missions over Normandy in a B-17 as a Bombardier. 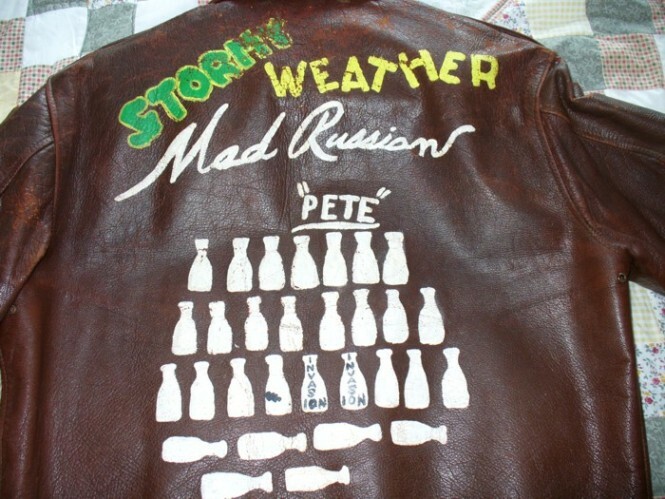 I have his flight jacket.Instead of painting bomds on the back of his jacket to represent the missions he flew my uncle painted milk bottles as he figured every mission he came back from was a "milk run". 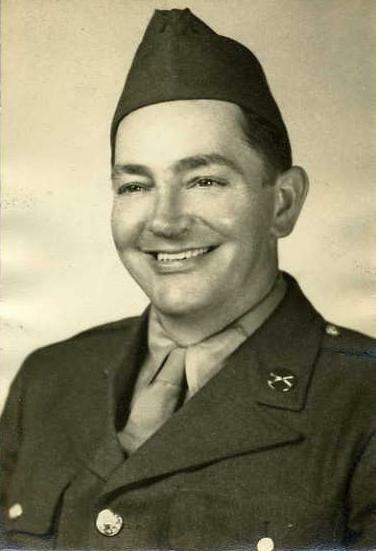 You will notice the two bottles marked invasion and also the bottle with a crack which was the mission on which he was injured and was awarded the Purple Heart. 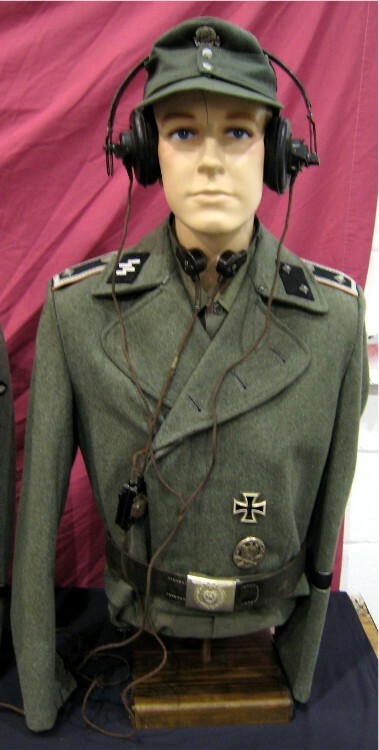 Here is a tunic from the Adolf Hitler Division that was heavily engaged during the Normandy landing and subsequent campaign. 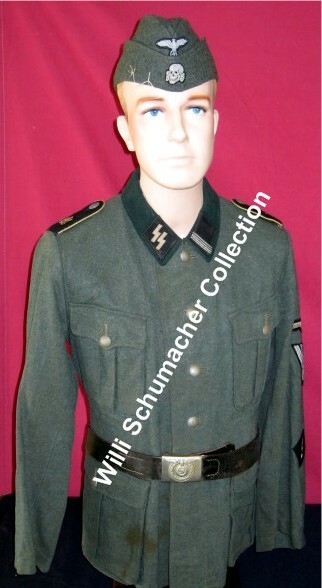 This is an SS-Rottenführer of Signals tunic with the LAH embroidered shoulder straps and 'blitz' sleeve diamond. The string on the overseas cap holds two former Soviet museum property tags. Great thread, here are a few I took a couple of weeks ago. 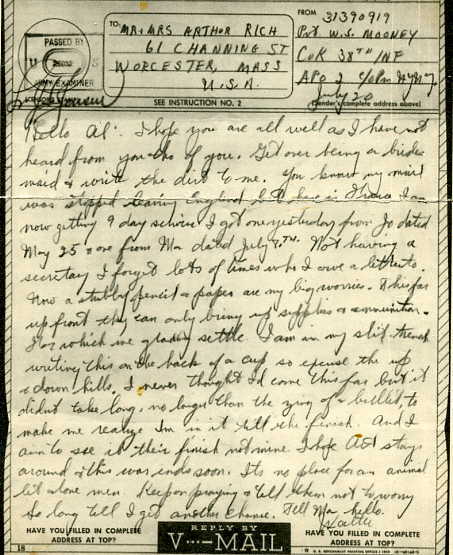 If you have trouble reading it, that is because as he mentions he was writing it over the top of his canteen cup in his foxhole at the line. 35 years old, Walter was named for a happy young uncle Walter Mooney who went to France in the Great War (it hadn't been numbered then) and returned a shell-shocked wreck who simply... vanished here in the 1920s as so many of that Lost Generation did. 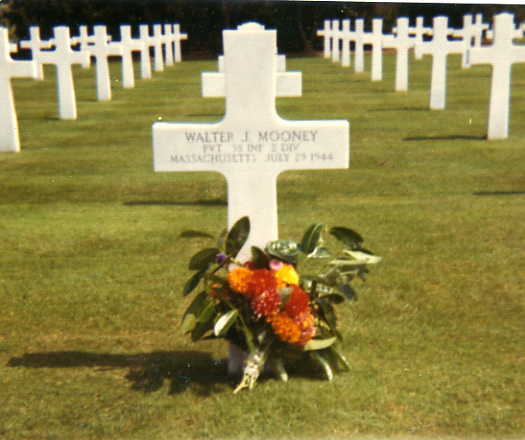 Greatuncle Walter's nephew my cousin Walter Mooney was killed as a 19 year old Marine in Viet Nam in 1966. 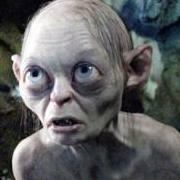 The family has never named another boy Walter. "History" does leave human consequences which linger long afterwards. At least for those paying attention who REMEMBER. The photo appears on wikipedia - "Welsh Guards in action near Cagny 19th July 1944." 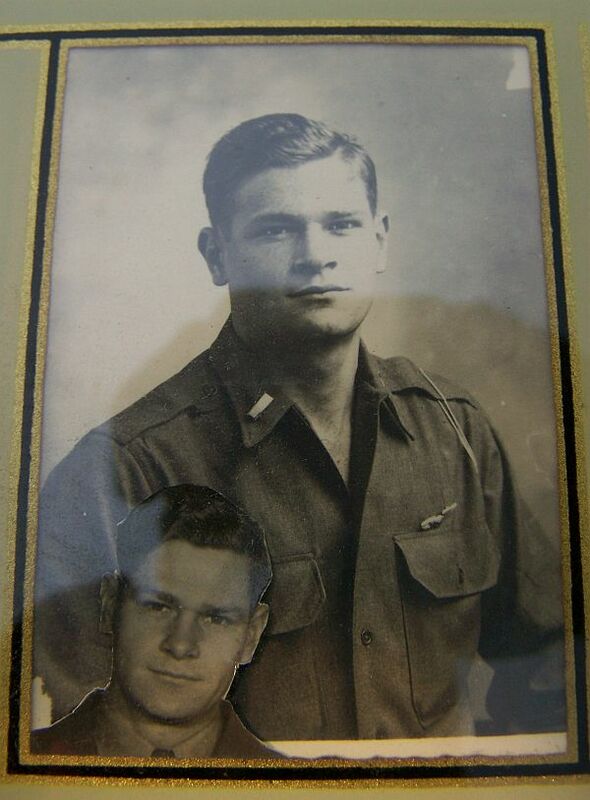 Uncle George is the man laying in the foreground & is named on the photo which appears in John Ellis's book "The Welsh Guards in War" & shows men of No. 4 Company, 1st Bn Welsh Guards just prior to assault. The Company Commander, Major John David Alfred Syrett, standing next to Sergeant Veasey (Later Company Sergeant Major of The Prince of Wales's Company) who is pointing into the distance, was killed a couple of days later on 22nd July aged 28 years & is buried at Banneville La Campagne War Cemetary, Calvados, about 8 kilometres east of Caen. 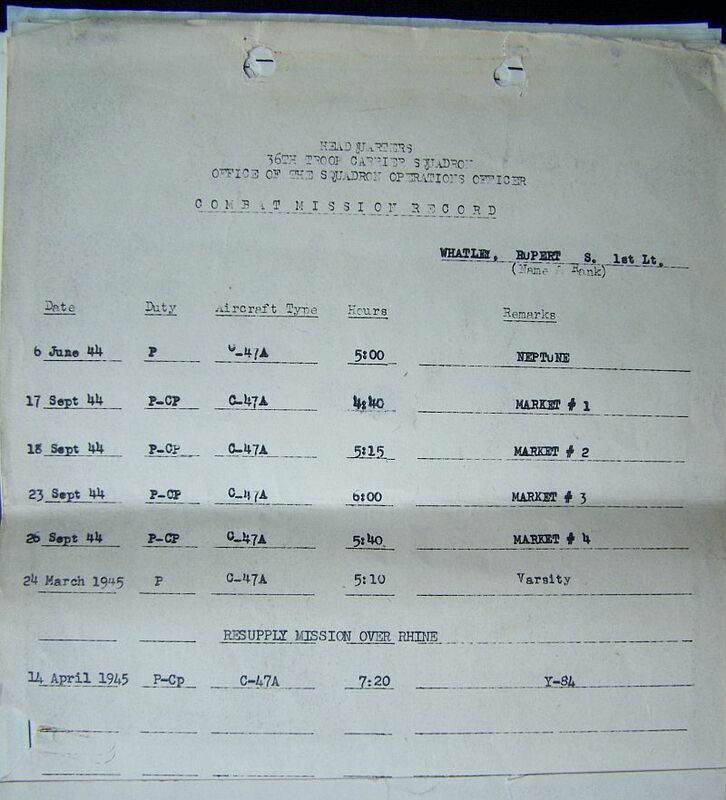 Most of the men buried there were killed in the fighting from the second week of July 1944, when Caen was captured, to the last week in August, when the Falaise Gap had been closed and the Allied forces were preparing their advance beyond the Seine. The cemetery contains 2,170 Commonwealth burials of the Second World War, 140 of them unidentified, and five Polish graves. The photo was taken during "Operation Goodwood", the largest armoured assault that had yet taken place in western europe & intended to break through the German positions east of the Orne and north of Caen & clear the Germans from the Bourguebus Ridge. 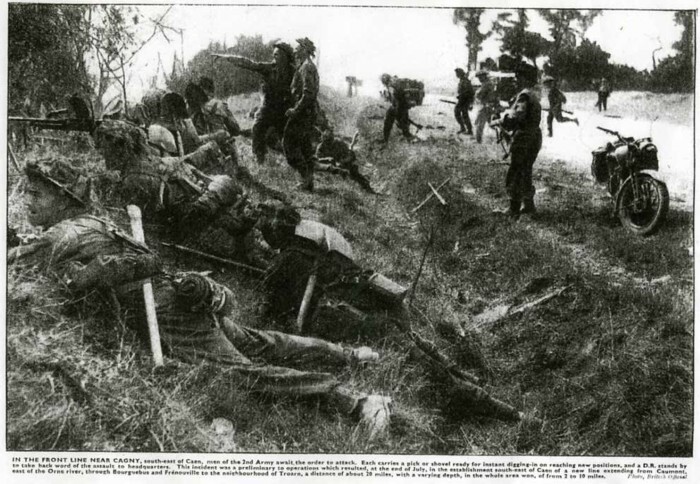 "IN THE FRONT LINE NEAR CAGNY, south-east of Caen, men of the 2nd Army await the order to attack. Each carries a pick or shovel ready for instant digging-in on reaching new positions, and a D.R. stands by to take back word of the assault to headquarters. This incident was a preliminary to operations which resulted, at the end of July, in the establishment south-east of Caen of a new line extending from Caumont, east of the Orne River, through Bourgebus and Frenouville to the neighbourhood of Troarn, a distance of about 20 miles, with a varying depth, in the whole area won, of from 2 to 10 miles." Vrey interesting SS tunic,thanks for sharing. 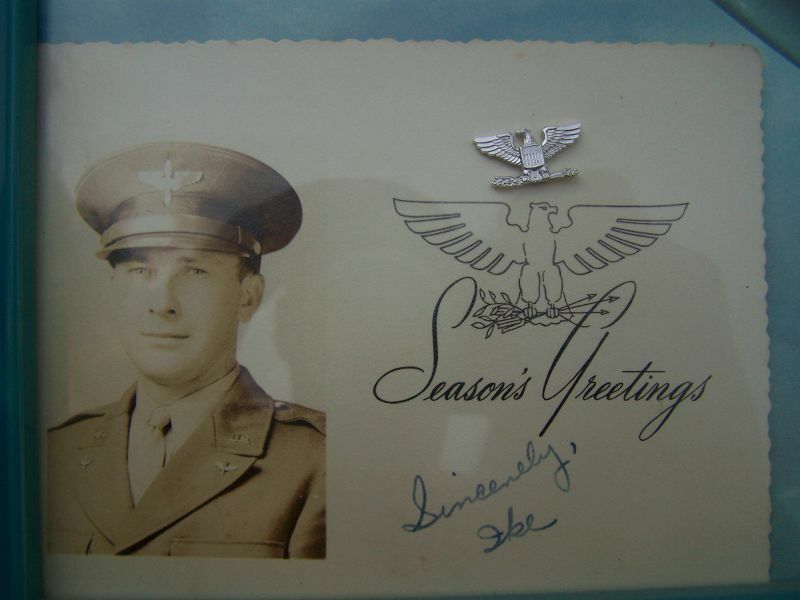 My grandmothers brother Stillman flew over Normandy. 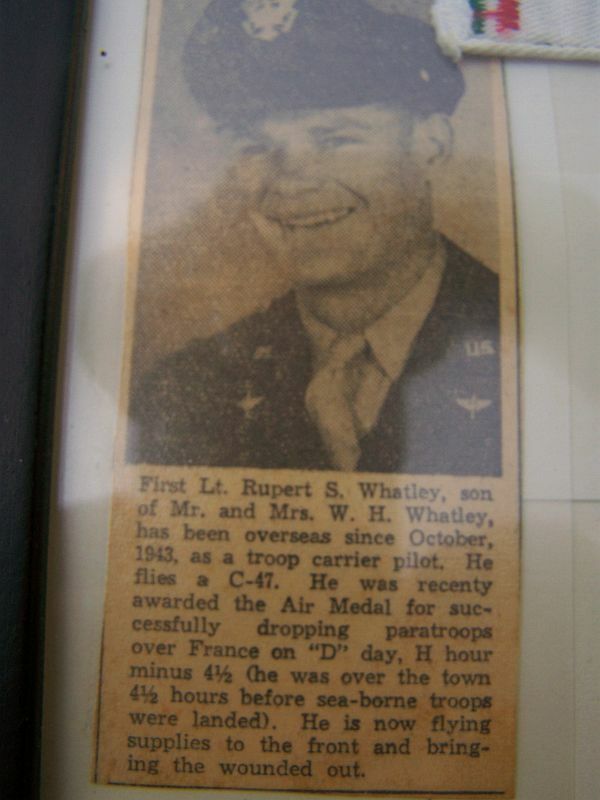 My grandfathers brother Ike was shot down around Normandy. 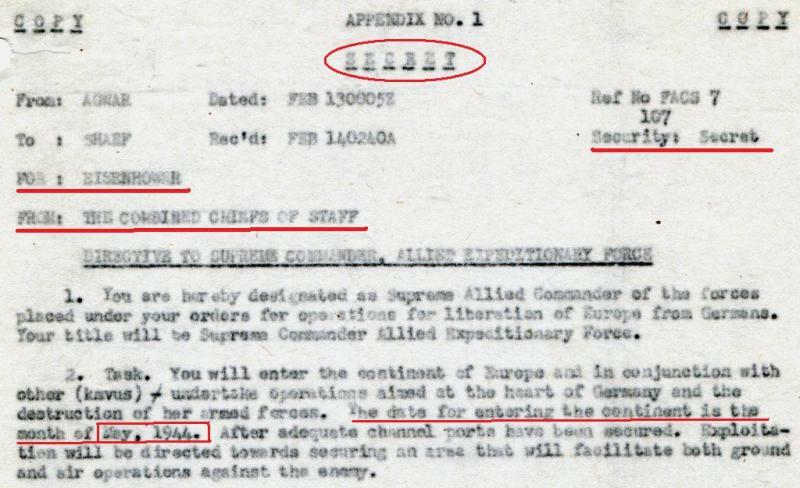 “You are hereby designated as Supreme Allied Commander of the forces”. Small part of the file what I have in my collection.